Colts fans with Windows phones… WE HEAR YOU! *Fantasy Stats (Real-time individual and team game and season stats from across the league via the official NFL stats engine). *Real-time scores from around the NFL, including summaries and box scores. *Watch Live streaming press conferences, and player/coach interviews. *Find the fastest way to and from the game with updated traffic maps. *Listen to the radio broadcast of the game. *Real-time breaking news from the Colts, previews of upcoming matchups and postgame blogs. *Photo gallery of game action. *Up-to-date rosters and depth charts. *Social Media: Aggregated twitter of the Colts’ official tweets, check in to the stadium on game day, one-click tweet of all media items, one-click Facebook posting of all media items. *Schedule of all upcoming games, scores/stats of previous games from the season and ticket purchases. Download the FREE Windows version, today. Colts fans can also download the app free from iTunes, Android or the BlackBerry Store. The Indianapolis Colts today elevated defensive tackle Jeris Pendleton and cornerback Sheldon Price from the practice squad to the active roster. The team also signed center Thomas Austin, defensive end Jake McDonough and running back Tauren Poole to the practice squad. Pendleton, 6-2, 334 pounds, was signed to the Colts practice squad on December 3, 2013. He was originally selected by the Jacksonville Jaguars in the seventh round (228th overall) of the 2012 NFL Draft. Pendleton played in four games and made one solo tackle in 2012 before being released by the Jaguars on May 22, 2013. He then signed with the Dallas Cowboys on June 12 and was released on August 26. Pendleton played two seasons at Ashland University and totaled 84 tackles, 11 tackles for loss, 6.0 sacks and three forced fumbles in 22 games started. Price, 6-2, 180 pounds, was signed by the Colts as an undrafted free agent on April 30, 2013 and was signed to the practice squad on September 1. He competed in 47 games (45 starts) at UCLA and totaled 157 tackles (123 solo), 21 passes defensed, five interceptions and two forced fumbles. Price participated in the 2013 East-West Shrine Game following a senior season in which he started all 13 games and tied for the team lead with a career-high four interceptions. Austin, 6-4, 310 pounds, has played in one game this season at Kansas City (12/22). For his career, he has competed in eight games, making one start. Austin was signed by the Colts as a free agent on August 1, 2013 before being signed to the practice squad on September 1. McDonough, 6-5, 305 pounds, was originally signed by the New York Jets as an undrafted free agent on May 10, 2013 and was waived on July 25. At Iowa State, he played in 40 career games (26 starts) and totaled 89 tackles, 13 tackles for loss, 5.0 sacks and three passes defensed. As a senior in 2012, McDonough earned All-Big 12 first-team honors and was named Iowa State’s Defensive Lineman of the Year after finishing the season with 36 tackles, 5.5 tackles for loss and 2.0 sacks. Poole, 5-10, 210 pounds, was signed by the Carolina Panthers as an undrafted free agent on May 11, 2012 and spent his entire rookie season on Injured Reserve after suffering an injury in the preseason. He was then signed to the Panthers practice squad on September 1, 2013 and was released on October 2. Poole played in 50 career games (25 starts) at Tennessee and rushed for 1,898 yards and 16 touchdowns on 423 carries. He also posted 45 receptions for 343 yards and one touchdown. The Indianapolis Colts today waived center Thomas Austin. Austin played in his first game of the season last week at Kansas City (12/22). For his career, he has competed in eight games (one start). Austin was signed by the Colts as a free agent on August 1, 2013 before being signed to the practice squad on September 1. The NFL today announced that Indianapolis Colts inside linebacker Jerrell Freeman has been named AFC Defensive Player of the Week for Week 16. The award is the first of Freeman’s career and the fourth for the Colts this season (Andrew Luck – Player of the Week in Week 7, Robert Mathis – AFC Player of the Month in October and Adam Vinatieri – Player of the Week in Week 11). Last week during the team’s 23-7 victory at Kansas City, Freeman recorded a team-leading seven tackles (three solo), 1.0 sack, two interceptions, one forced fumble and three passes defensed. It was his first career multiple-interception game and the picks were the second and third of his season. Freeman tied the franchise record for interceptions in a game by a linebacker, which was last accomplished on December 9, 2007 (Gary Brackett vs. Baltimore). With his sack, Freeman tied Larry Chester (6.5) for the third-most career sacks by a Colts undrafted player. He also set a club record for the most forced fumbles by a Colts undrafted player, topping Tony Siragusa’s previous mark of five. Through 15 games this season, Freeman leads the team with 159 tackles (105 solo) while contributing with 4.5 sacks, 10 tackles for loss, three interceptions, five passes defensed, five forced fumbles and one fumble recovery. He posted his first career multiple-sack game (2.0) in a Week 2 contest at Miami and has led the team in tackles in 10 games this year. The Indianapolis Colts today signed linebacker Alan Baxter to the practice squad and placed defensive tackle Montori Hughes on Injured Reserve. Baxter, 6-0, 238 pounds, was originally signed by the Pittsburgh Steelers as an undrafted free agent on April 27, 2013. He was then signed to the Steelers practice squad on September 1 and released on October 11. Baxter played in 52 career games (24 starts) at Northern Illinois and finished with 152 tackles, 30.5 tackles for loss and 16.0 sacks. As a senior in 2012, he was an All-Mid-American Conference first-team selection after leading the team with 9.5 sacks and 11.5 tackles for loss. Hughes was selected by the Colts in the fifth round (139th overall) of the 2013 NFL Draft. He appeared in four games this season, making seven tackles, including four solo stops. Intro: Indianapolis controlled every aspect of the game at Kansas City over the final 56 minutes. The Colts did not allow a point, ran for 135 yards, forced four turnovers and had four sacks and won going away (23-7) in a very tough road venue. INDIANAPOLIS – With one game left in the season, Indianapolis is in play to move to the AFC’s second playoff seed, or it could shift to third or stay put at fourth. Regardless, it has been a season of accomplishment on all fronts, and the Colts are gearing for a 16th playoff berth in 30 seasons in Indianapolis. Indianapolis was dominant at Kansas City on Sunday, bouncing back from a 7-0 deficit with 56 strong minutes on defense and with an offense that thrived accordingly. A two-game winning streak has the Colts at 10-5 and creating momentum beyond next Sunday. After the club’s fourth-largest victory margin and the fourth over an opponent with 10-plus wins, here are FIVE THINGS LEARNED. OFFENSIVE LINE INTEGRITY – If Chuck Pagano had his way, Santa Claus might put a little something extra in the stockings of OL coaches Joe Gilbert and Hal Hunter. The Colts started their seventh different line of the season Sunday at Kansas City, and it was the fifth straight week a different unit opened. While Samson Satele and Mike McGlynn are regulars, along with tackles Gosder Cherilus and Anthony Castonzo, Xavier Nixon was making his first start at left guard. Nixon, a natural tackle, made his career debut (in extended play) the previous week against Houston at right guard. The Colts managed with a 10th 100-yard ground day, played turnover-free ball and Andrew Luck was sacked once. While the offense is an 11-man operation, if the line doesn’t perform everything gets ugly (in all phases). Kudos to the coaches and everyone associated with a stellar performance. RESILIENCY IN GETTING BACK ON TRACK – A band of brothers hung tough after a 6-2 start went to an 8-5 juncture. Indianapolis has rallied with two straight wins where every phase of the team performed well – particularly the defense and ground game. The Colts have forced six turnovers and eight sacks in two games and have allowed only six-of-23 third downs to be converted. The Colts led for the final 54 minutes against Houston and did not surrender a point at Kansas City over the final 56 minutes. Indianapolis held the Texans without first downs on seven-of-14 possessions, including a five-possession marathon stretch. While Houston had no post-season designs, Kansas City did, and Indianapolis shutout the Chiefs on five-of-seven drives, while one that did yield a first down ended two snaps later with a fumble. The season never was in extreme jeopardy, but a five-game lull tested moxie around the locker room. MAKING YOURSELF RELEVANT – Chuck Pagano used the phrase about Griff Whalen in training camp and while Whalen has done a very good job of doing so, Donald Brown has done a whale of a job. Brown on Sunday scored on a 33-yard reception and a 51-yard run. It was the first scoring run beyond 50 yards for Indianapolis in 33 games, and Brown had that last one as well in 2011. Brown has a 5.6 average on 90 rushes, bucking to become only the fourth Colts back ever to have a 5.0 average on 80 seasonal attempts. It has been done just once in the team’s Indianapolis era (George Wonsley, 1985), and Brown has contributed 24 receptions for two more scores. Undervalued by many outside observers, Brown has cast himself in a much different public light. His integrity and ethic are exemplary in all areas. TEN WINS TRULY NOTEWORTHY – Indianapolis had a nine-year streak (at the time the NFL’s second-longest in history) with 10-plus wins end in 2010. Ryan Grigson and Chuck Pagano have reconstructed a roster where only 10 players remain from 2010 and before. Indianapolis has gotten to 10 wins in a year when a league-high 72 players have been pressed into service. Getting to 10 wins is an accomplishment for any team and though this is the 13th in 30 seasons in Indianapolis, it is only right to acknowledge achievement. PLAY TO WIN – Pagano was vocal in recent weeks about the NFL scheduling 16 games and that he intends to play them all. Indianapolis still can grab the coveted second seed. The Colts could jump to third or stay fourth. Regardless, he plays to win and this Sunday should be no different. 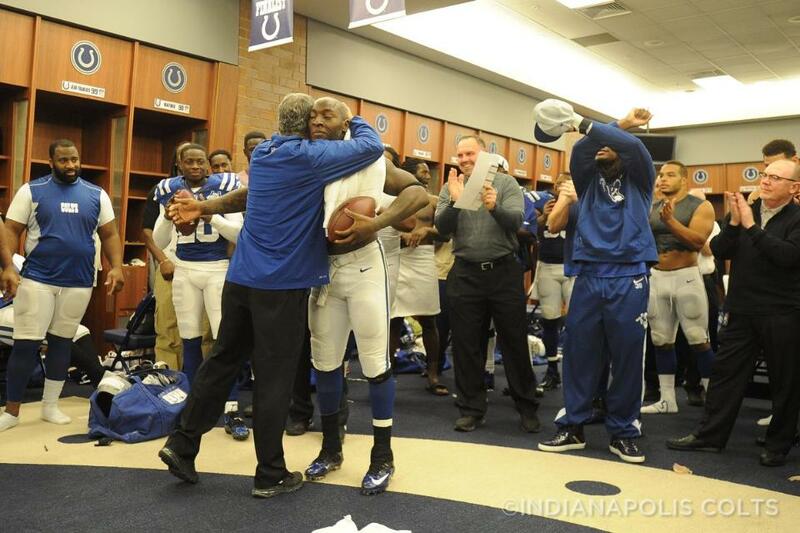 Pagano has instilled a process around the team in which players buy in and excel. The process sustained through his 12-game absence last year and with his full-time presence this year. So much of coaching is messaging to players. Players buy Pagano’s message. What does Sunday’s win mean for the Colts and the playoffs? Thanks to a 23-7 win over the Kansas City Chiefs on Sunday, the Colts have kept hopes alive for a potential bye. The Colts (10-5) will need to beat Jacksonville (4-11) at Lucas Oil Stadium next week and get a little help from the Bengals and Patriots to have that happen. Right now the Colts still sit in the 4th spot of the AFC Playoffs. If New England loses either today to Baltimore or against Buffalo next week, then the Colts will jump them in the AFC Playoff Picture. If Cincinnati loses next week to Baltimore, then the Colts will jump them. The Colts will finish anywhere from the 2-4 spot in the AFC. 1. Denver (11-4, 8-3 in the AFC): Has clinched the AFC West. 2. New England (10-4, 7-3 in the AFC): Can clinch a playoff spot with a Bengals loss. Can clinch the AFC East with a win or a Miami loss. 3. Cincinnati (10-5, 8-4 in the AFC): Has clinched a playoff spot. Can clinch the AFC North with a win and a Baltimore loss. 4. Indianapolis (10-5, 8-3 in the AFC): Has won the AFC South. 5. Kansas City (11-4, 7-4 in the AFC): Has clinched a playoff spot. 6. Baltimore (8-6, 6-4 in the AFC): Can clinch a playoff spot with a win and a Miami loss and a Chargers loss. On Friday, the Colts designated five players to be doubtful for Sunday’s game – safety Sergio Brown, guard Jeff Linkenbach, defensive tackle Ricky Jean-Francois, guard Joe Reitz and defensive tackle Montori Hughes. Among players listed as questionable to participate was guard Hugh Thornton. All of those players were declared out for Sunday’s game today. A banged-up Colts team was limited through many parts of the roster in preparation for Kansas City. To help bolster an offensive line depleted of three guards, Indianapolis elevated Thomas Austin off the practice squad Saturday and released running back Shaun Draughn. The Colts’ line will be operating with a seventh different starting alignment on Sunday that could include rookie Xavier Nixon at left guard. A natural tackle, Nixon played 61 plays at right guard last Sunday against Houston when Reitz left with a concussion. The Colts have used a league-high 71 players this year and will be starting a different offensive line in a fifth straight game. Indianapolis will be facing potent Kansas City special teams return units, and Brown has been the club’s top specialty performer this season. Brown was hurt during last week’s game, and this is his first missed outing. Francois has missed the past two contests and could be ready for the Jacksonville finale. Indianapolis is the lone NFL team to clinch a division title. The Colts currently are the AFC’s fourth seed, with division leaders Denver, New England and Cincinnati owning better records. Kansas City at 11-3 is tied with Denver record-wise, but the Chiefs lost both games to the Broncos and would need to finished with a better record in the last two games to wrest the AFC West crown. A loss to Kansas City would cement the fourth seeding for the Colts. Indianapolis could move to the second seed with two wins to close the season, if Baltimore could win its final two outings. The Indianapolis Colts today elevated center Thomas Austin from the practice squad to the active roster and waived running back Shaun Draughn. Austin, 6-4, 310 pounds, has competed in seven career games (one start) with the Houston Texans (2011) and Carolina Panthers (2012). He was signed by the Colts as a free agent on August 1, 2013 before being signed to the practice squad on September 1. Draughn was signed by the Colts as a free agent on December 17, 2013. In 20 career games, he has totaled 63 carries for 235 yards and two touchdowns. The Colts defense is playing a game of ping-pong in the locker room. There’s Robert Mathis answering questions about being under consideration for Defensive Player of the Year, yet giving all the credit to his teammates. Around the locker room there’s Mathis defensive teammates throwing it right back to No. 98. No matter who is right or wrong, there’s no denying that Mathis is in the talk for 2013 Defensive Player of the Year. Mathis is a man of few words but his league-leading 16.5 sacks and six forced fumbles do plenty of talking. “I would credit that more to our defense then just the individual on it,” Mathis says of his name being in the discussion. When Mathis was chosen in the fifth round of the 2003 draft, he was simply trying to find a spot on special teams. Now 11 years later, Mathis is turning in a career-year at the age of 32 and garnering the deserving national attention. What impresses Mathis’ teammates so much is how he has gone about piling up his sacks/forced fumbles. Mathis acknowledges his consideration for such a honor but he, and his teammates, make it clear that he’s racking up these numbers within the framework of the defense. “Win it or not, it’s an honor to be considered,” Mathis says.